At the close of each month, reform SACEMS portfolios using ETFs with the highest total returns over the past four months. 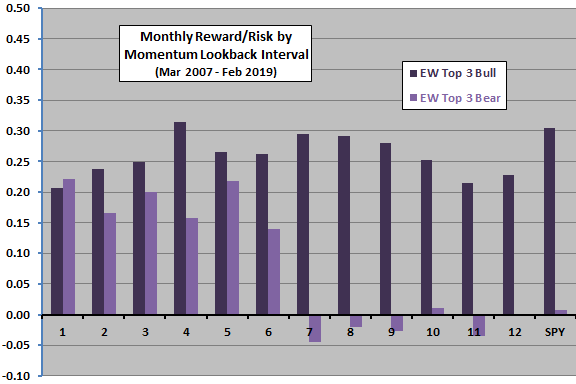 For Top 1 and EW Top 3, returns are lower and more volatile during bear months. Top 1 returns are especially volatile during bear months. Average SPY return during bear months is very low, and returns are very volatile. Diversifying SACEMs via EW Top 2 and EW Top 3 progressively suppresses volatilities of both bull and bear months. 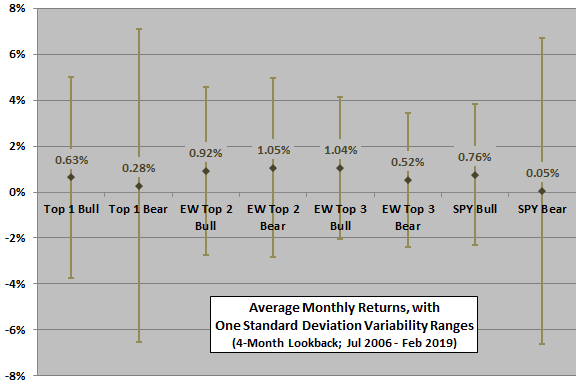 For a risk-adjusted perspective, we compare ratios of average monthly gross returns to standard deviations of monthly returns (monthly reward/risk). 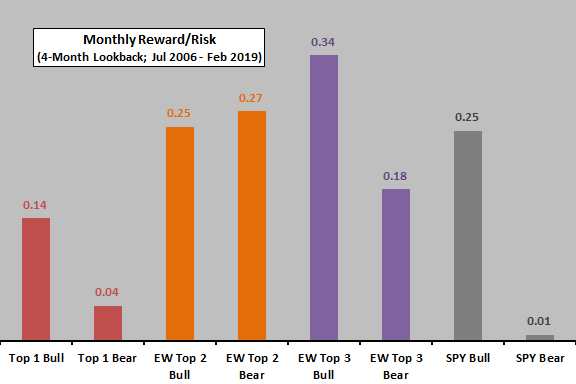 The next chart summarizes monthly reward/risk for SACEMS Top 1, EW Top 2 and EW Top 3 portfolios and for SPY during U.S. stock market bull and bear months separately. Findings parallel those above. Are findings robust to different momentum measurement lookback intervals? Optimal lookback intervals during bull months are in the range four to nine months. Optimal lookback intervals during bear months are in the range one to six months. All longer lookback intervals perform poorly. Progression of performance by lookback interval is not systematic. Findings are likely sensitive to the time series shapes of U.S. equity bull and bear markets within the sample period (especially that of the 2008-2009 crash) and therefore may not be representative of future bull and bear markets. In summary, evidence from the available sample support belief that short asset class momentum lookback intervals provide better protection from U.S. equity bear markets than long lookback intervals. As noted, performance data are gross, not net. Accounting for costs of monthly portfolio reformation would reduce performance. As noted, results may be sensitive to the time series shapes of bull and bear markets, and sample size is extremely small in terms of number of bull and bear regimes. Lookback interval optimization introduces data snooping bias (lucky and unlucky exploitation of randomness), which is elevated for small samples. Changing the universe of SACEMS assets may affect findings (depending on the mix of equities versus other asset classes).